Photo courtesy of the Los Angeles County Fire Department Press Information Office Twitter. 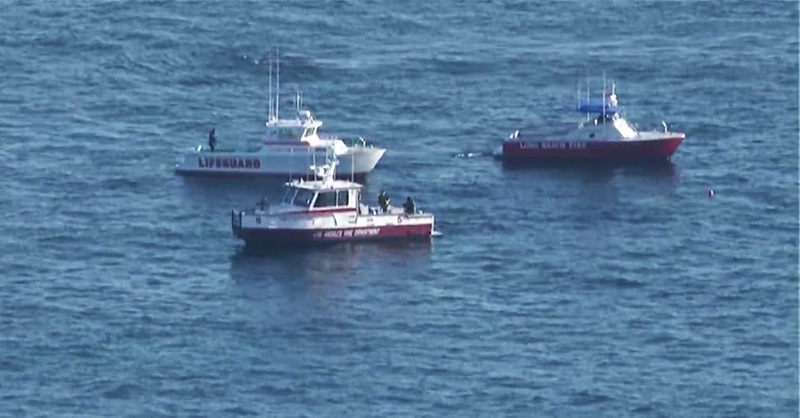 UPDATE | Multiple agencies continue to search for survivors after a mid-air collision between two planes sent the aircraft crashing down off the Long Beach Harbor Friday afternoon, authorities said. At 3:30 pm, a small aircraft was witnessed crashing into the ocean, 2 miles south of the Port of Long Beach. Rescue divers searching. #LightIC Update @USCGLosAngeles and #FAA confirms this was a mid-air collision between two aircrafts. This story was updated at 5:30PM with a tweet from the Long Beach Fire Department. 2/5/16 at 4:16PM | The Long Beach Fire Department (LBFD) is currently coordinating efforts with other agencies in responding to the crash of a small plane in the water near Long Beach Harbor, according to LBFD tweets and LBFD spokesman Mark Miller. According to Miller, reports of the crash of a small plane came in around 3:30PM. While fire officials have not yet found the plane, they have located a small debris field on the water and LBFD divers are currently searching the water for people. We are responding to reports of a aircraft in the water. Our boats are enroute. Multiple agencies responding and coordinating efforts on the water. Miller said officials were unaware how many individuals were inside of the plane. A tweet by the Los Angeles County Fire Department stated that LA County lifeguards, the Los Angeles Fire Department (LAFD) and the LBFD were responding to the reports of the plane crash in the water.